Tristan Hart eventually slips into madness. At first, he is only Tristan Hart: a young boy living in the 18th century. Then Caligula invades his life. Then Bloody Bones. And he tries to solve the frightening riddles and abominable fairy tales that have plagued him (and his best friend Nathaniel) since they were 15. The Drumming became suddenly much louder. I started, and upon an Instinct turned once more toward the approaching Danger, as doth a Coney when it heareth Hounds. Seizing my shoulders, he forced me roughly about, so that I was forced to face him. The Drumming became deafening; I marvelled that Colonel Simmins did not appear to hear it. Then the Notion struck me that perhaps he could; perhaps that was why he was shouting, why little Flecks of Spittle were collecting on his Chin, and why his Adam’s Apple was straining against his thick white linen Stock. He was struggling to make himself heard above the Drumming. ‘They are here!’ I shouted. ‘What, Sir?’ Could not he hear me? The drumbeats (and paranoia) reappear throughout the novel as Tristan becomes little soldier boots—Caligula—as he discovers his need for inflicting pain upon others. While studying anatomy and surgery under Dr. William Hunter (anatomist and surgeon best known for publishing commissioned sketches of developing fetuses) he becomes sexually obsessed with pain and struggles to contain his own evilness, his madness. Love of pliable Katherine helps him somewhat—until he goes too far with friends and imagined enemies. Themes that run throughout this lively, visceral tale and bring it to its Bloody Bones-end are the loss of a mother; the struggles of science and society, superstition, madness, and of course, how the tropes in fairy tales morph from simple tales to perceived reality when a young man succumbs to mental illness. “. . . Mine Aunt liked to appear more magnificent than she really was. We were many Miles from London, yet she wore her Wigg tall and fashionably dresst, exceptionally high heeled Shoes, and the Skirt of her Dress extended by an Hoop so wide that she was forced to pass thro’ every Doorway crabwise. Her visage was thick with white Lead and usually decorated with a Number of patches to obscure the worst Ravages of childhood small Pox. I could never contemplate her without some Stirrings of Disgust. When I was a child I used to flee from her Visitations to the Ha-ha and the High Field. If she caught me running, I would have to suffer a lengthy Chastisement for all my Sins, which she plainly considered it her Duty to discharge. One Afternoon, when I was seven and still in Mourning for my Mother, she made me stand still with my Back against the chill drawing Room Wall for three Houres, while she played Cards with my Sister and her own Son before the flaming Fire. Tristan lives in a time when exploration in the medical sciences was burgeoning—especially in anatomical and physiologic studies. And new scientific hypotheses and discoveries frequently collided with superstition. Incorporating philosophers, medical men, and writers of the time, author Jack Wolf creates scenes where Tristan takes medical thought, such as La Mettrie’s Man Is Machine, and bends it to suit his illness. Ironically, La Mettrie was against violence of any kind and developed theories of remorse. In fairness to Tristan, he had remorse, for a while, and both La Mettrie and the young Tristan shared hedonism. The use of fairy tales (and gypsies) to express Tristan’s relationships with authority, his friends, his conquests, his love, and his ultimate plunge into madness is phenomenally rendered. 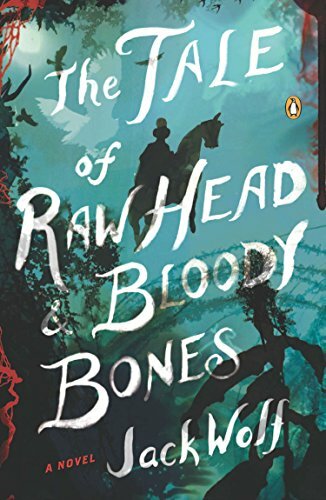 The tales of Bloody Bones and his nemesis, Raw Head, ultimately take over the novel until even the reader is unsure what is real and what is imagined. The Tale of Raw Head and Bloody Bones is not breezy or lighthearted, for in a clear and logical voice, Tristan Hart can rationalize his madness, making this story at times ravaging, revealing, and primeval. But ’tis a tale that will make you acutely aware of how madness descends—and inexorably pull you into its clutches.